Before you begin any tile project, you need to choose your tile. If you choose a natural stone over a glazed ceramic or porcelain tile, consider moisture sealers for wet areas. Another important consideration is whether the tiles will be slippery when wet. You don’t want your new shower or bathroom floor to be an accident waiting to happen so try and choose a tile that has some surface grip to it. Measure the width and length of the area to be tiled and multiply together and add 10% to that estimate for cutting and waste. This is how much tile you need to purchase. 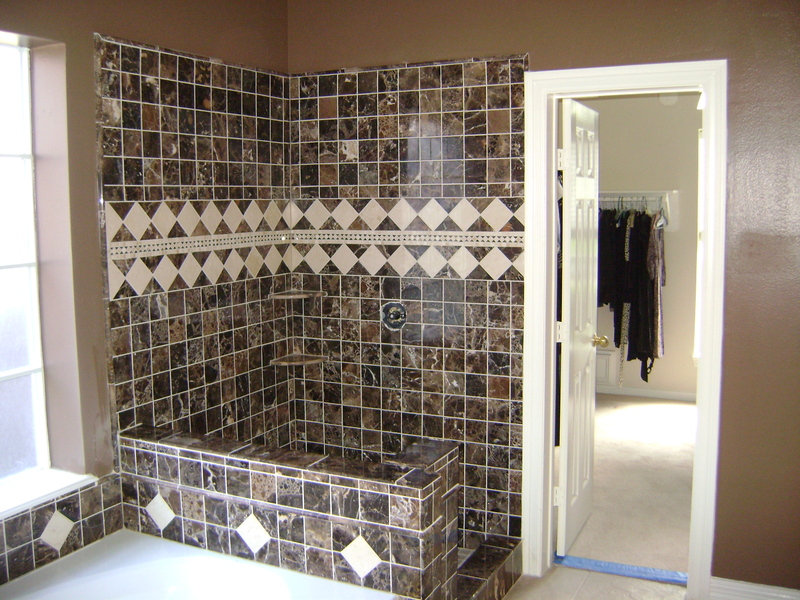 The bathroom is one of the few rooms in your house where you can afford to feel very creative with tile patterns so consider matching trims, glass mosaics, or other borders within your shower design. As you can above, there were several borders and trims used in the design to create a visual delight. Once you have selected your tile, you will also need to buy grout to match. For tiles spaces 1/4″ or less, use non-sanded grout; for tiles spaced 1/4″ or more, use sanded grout. Also keep in mind, the lighter the color, the harder to keep clean however there are sealants that can help with this task but you have to be diligent about resealing every two years. 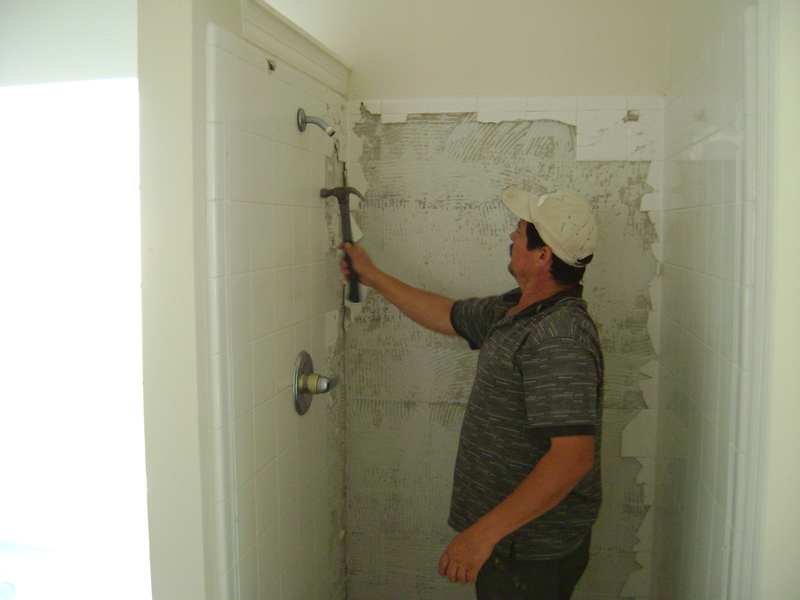 Finally, you will need new wet board/cement board for the new shower walls. A good mortar mix that is compatible with the tiles you have selected, a trowel, a rubber grout float, a large sponge and tile spacers. Most grouts and mortar mixes have a handy guide on their labels to determine how much you will need. I also like to buy “throw away” buckets, one for grout and one for mortar. A wet tile saw or manual tile cutter and tile nippers are needed to cut tiles. Safety first! Always wear safety glasses, long sleeves and gloves when demo’ing tile as the shards of broken tiles can be like broken glass! This is the fun part of any job…demo! I sometimes wish that demo wasn’t the beginning of projects but rather at the end. I know that may sound silly, but its a great process to take out frustration with a big hammer! Usually, your frustration level will me greater at the end, than the beginning. I digress. 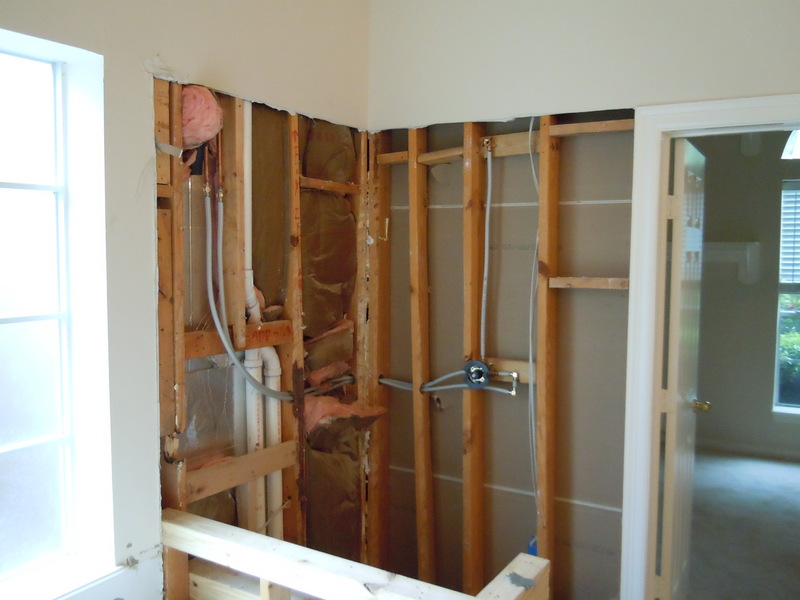 Before the demo, you will want to turn off the water supply to the house and remove the existing fixtures. 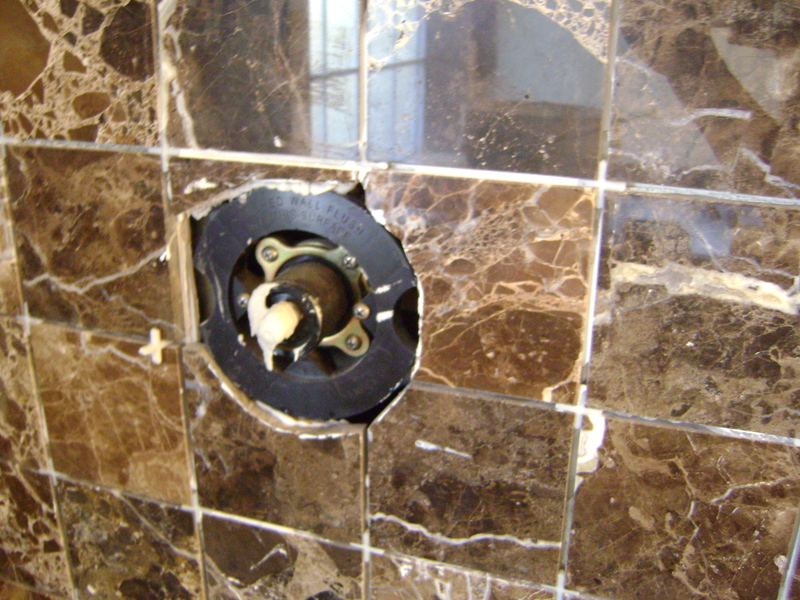 Shower faucets usually have a screw that holds the faceplate in place and the knobs usually have a set screw on the bottom. The shower head and arm simply removes by turning to the left; you may need a wrench for the removal. Cover the arm with a towel so you don’t scratch the surface if you will be reusing. Now, for the fun part. I recommend putting a sheet or cardboard down to protect your existing floors from falling debris. Using a heavy duty hammer or as I call it, a “mini” sledge hammer with a heavier top than a regular hammer, and a chisel, pound away at the existing tile. If you start at the outer edges and work your way in, you may find that the tile is placed on “sheets” of existing wetboard which can be pried away from the studs and simply removed in big sections at a time with tiles still attached. 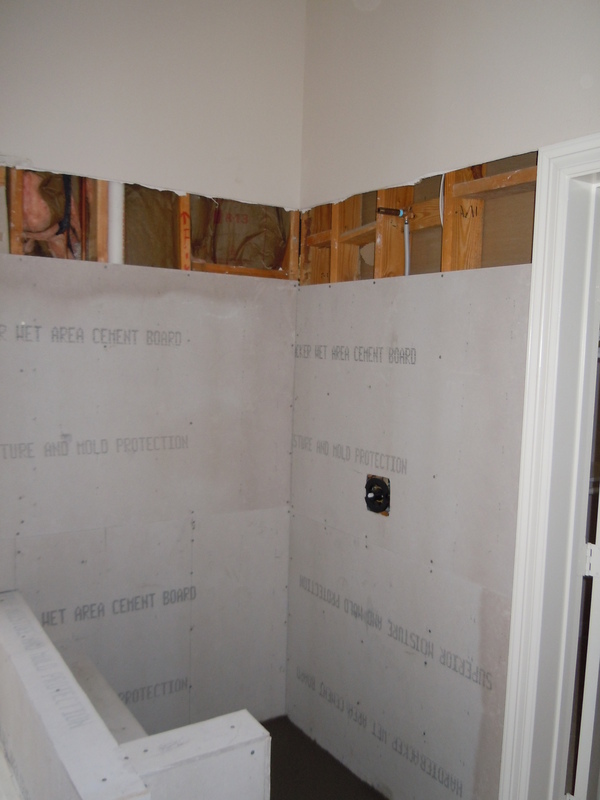 Check the fit of the backer board to each wall and cut with a utility knife or drywall saw. Use as many full sheets as possible to avoid a lot of cuts. Ensure your holes are made for your faucet and shower head. Secure with cement backer board screws and caulk each head with silicone caulk. Apply mortar over the seams and smooth backer-board tape over feathering the mortar as flat as possible on the edges. Let dry. Determine your center on each wall and ensure your first row is level; mark a guide line with a pencil or chalk. Use spacers or a small piece of plywood strip to raise the first row of tile up from the surface of the shower pan at least 1/4″. This will later be caulked to ensure a nice watertight seal. Apply the mortar on the wall using the trowel at roughly a 45 degree angle to spread the mortar evenly. 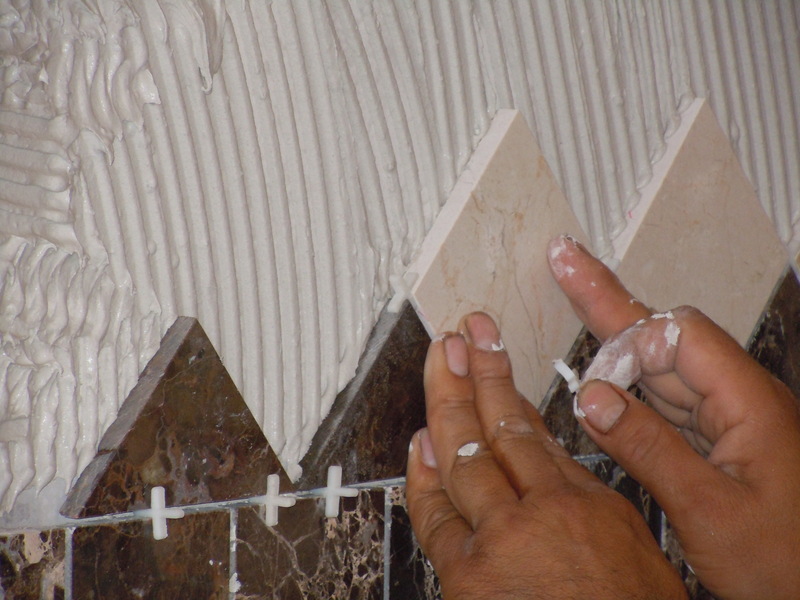 Set the first tile in place at your center guide line and press into place firmly to ensure good adhesion. You may choose to use a rubber mallet for this task. Place a spacer on each side of the tile before proceeding to the next tile. Keep laying tiles and ensuring that the tiles are level with one another as you go. Cut any tiles as needed in corners. For smaller curved cuts around the faucet handle or shower arm, make a few straight cuts into the area that will be open and use tile nippers to break the tile pieces off and nip off as needed to create the circular pattern. As long as the faceplate from your faucet covers the imperfections, there is no need to worry about the snipped pieces being smooth. 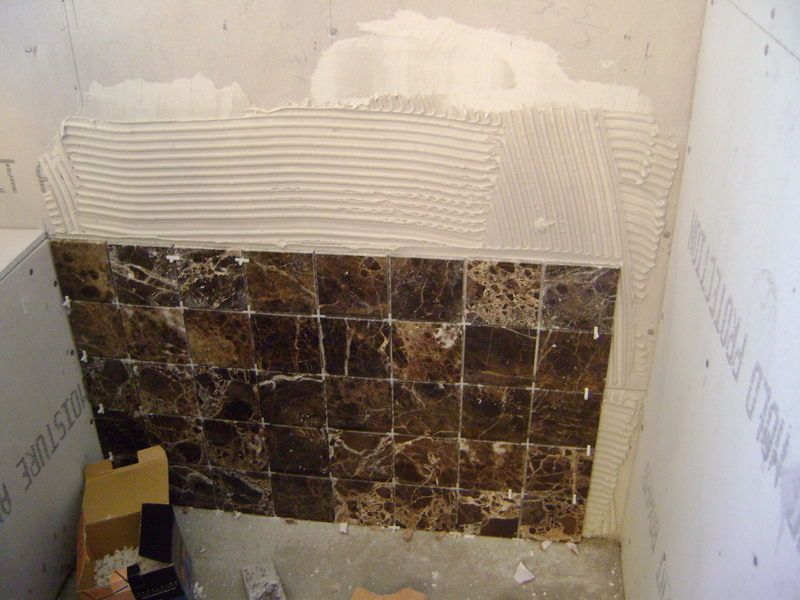 Once the tile has dried in place at least 24 hours, you can now remove the tile spacers. Mix the grout according to package instructions and apply the grout to the joint lines using the rubber float with diagonal strokes. Remove as much excess as possible. Do not let dry out before cleaning off excess grout with a sponge. Here is where I recommend wearing gloves because grout on your hands soaks the moisture from your skin like you wouldn’t believe! Another tip I use is to apply hand lotion heavily before and after I wipe with the sponge. Using a large sponge with clean water begin wiping the grout lines in a circular motion to “set” the grout in the lines and begin tile clean up. Keep wringing the sponge clean with water and wipe more to remove haze from the tile. It is helpful after a few swipes to renew with fresh water. If a slight chalky haze remains after your best efforts, try wiping with a clean dry paper towel. Allow the grout to fully cure overnight and then apply a sealer. There are some handy spray sealers now that I like. Just spray on in even strokes and you don’t even have to wipe! Caulk the lower edge between the tile and shower pan with a good quality silicone caulk. Silicone caulk is mildew resistant and doesn’t break down like non-silicone caulks do. Reinstall your faucet and shower head and caulk around the perimeter to ensure a good watertight seal.